Diverging Diamonds: Drivers’ Best Friends? There are only 5 of these in the country right now, but two more are under consideration for Gwinnett County, one at Pleasant Hill and I-85, the other at Jimmy Carter and I-85. UPDATE! Apparently there are also DDIs under construction at Ashford-Dunwoody and I-285 and someplace called “Cobb County.” More “how they work” details on that project are available at John Heneghan’s Dunwoody blog and “where the money comes from” details at State Rep. Mike Jacobs’ blog. Brian Allen, director of the Gwinnett County Department of Transportation, said the DDI projects are much-needed improvements that should increase capacity and help ease traffic congestion in two of the county’s busiest travel areas. The Gwinnett Place CID and the Gwinnett Village CID, in collaboration with County and State transportation departments, can fund the project through existing SPLOST revenues and CID taxes. “The DDI is truly a revolutionary system that allows drivers to cross over to the ‘opposite’ side of the road as they access the interstate, and because the new interchange uses the existing infrastructure, these DDI’s construction time and dollars needed are dramatically less than building a new interstate crossing,” said Mark Williams, Chairman of the Gwinnett Place CID Board of Directors. Open houses for public input and commentary will be held Thursday, Feb. 24 – 4 p.m. to 7 p.m Atlanta Marriott Gwinnett Place (1775 Pleasant Hill Road, Duluth) for the Pleasant Hill Road DDI, and Tuesday, March 1 – 4 p.m. to 7 p.m. at the Gwinnett CID offices (5855 Jimmy Carter Boulevard Suite 122, Norcross) for the Jimmy Carter Boulevard DDI. I don’t know how these things work, but they seem to be pretty cutting-edge. Kudos to the respective CIDs for pushing forward -the drivers of Gwinnett thank you. Here’s a video of one in action. I still don’t get it. I saw this a few months ago. They are truly bizarre but seem to work. Slightly tangential. My hometown, Moultrie, installed its first roundabout. It’s at a heinous 5 way intersection. And it’s already had its first wreck! But I’m still a roundabout fan. I drove through it last weekend and it greatly improved the safety of that intersection. It’s just one of those things that people can’t believe works until you understand how it works and then it’s no big deal. A post script. As I approached the new roundabout, a little old lady in a big Buick was in the roundabout and was stopping at every intersection. Like I said, it takes time to learn. But at least she was stopping. When I’m on my bike I watch out for those like a hawk. They installed a roundabout near my community(very rural area) and it has worked great. I like that DD, I still see a dangerous learning curve with it, but it should speed things up. The only one I can think of up in the mountains is up by Big Canoe on Steve Tate off 53… are there others? St. Simon’s has several roundies, people have learned to use them and they work very well. I hear one is coming to Emory Village. the big benefit is that there is no stopping at a light with no other traffic around, you just keep rolling. Yeah… I was just thinking N GA mountains wise though (screen name of mountainpass). It seems like there’s also one at the WalMart in Dawsonville, but I can’t think of any others in N GA. I love roundabouts… wish they’d put quite a few more in. There are at least two in Dawsonville. One at the Walmart(as you mentioned) and one across 400 beside the outlet mall. Europeans have had roundabouts for many decades, and since they understand the concept, they work well. Training American society how to use them would certainly be a challenge, but it would be worth it. Same for this diverging diamond idea. I can imagine that some would be very tentative about crossing to the other side of the road. Just replace roundabouts with government run healthcare and you can explain our politics for the last few years. I’ve had discussions with Europeans about their government run healthcare, and I could not disagree with you more. People cheerlead the successes of them, but they ignore the liabilities. They really only have specific cases when they are useful. In general, they break completely when 2 intersecting roads have heavy traffic and are wasteful when 2 roads have very light traffic, as they take more space to build, especially on high speed roads. To see why they are bad when two intersecting roads are extremely busy, imagine a continuous stream of cars coming in at 6 o’clock that head counter-clockwise to the the 3 o’clock position which also has a contiuous stream of cars. The cars from the first position enter the traffic circle first and have right of way. Since the stream is continuous, or nearly so, the other busy route has to stop. Traffic from this road slows to a trickle and backs up to the preceeding traffic circle, which then fills which blocks the roads that intersect with that. From what I have read, this type of “gridlock” or circlelock, is extremely difficult to clear. Also pedestrian and bicycle safety get thrown entriely out the window. Traffic is designed to never stop. How do you cross a busy intersection? Yes, traffic is generally slowed, but that also has the tendancy to bunch traffic closer or worse, back it up a little, meaning even gaps can disappear at the inersection. Also, any bicyclist will tell you that the worst thing is to approach an intersection near the inside when traffic frequently turns right. Cars will pass you and turn through you like you aren’t there. In a traffic circle, all exits are right turns and although traffic is slowed, it is turning (few people are capable of holding a line in a curve) the cars are still faster and likely to pass cyclists, meaning they will likely turn through them. Now, another problem with busy roads. Speed limits might be 55+, but in a roundabout, it might slow to 30. Everyone knows the capacity of a toll road is the capacity of it’s slowest toll booth. The same is true for any road. The road capacity is limited by the slowest segment. Traffic will bunch up a little, which will offset some of the capacity lost due to slower speeds, but in heavy congestion, this is extremely limited. In short, traffic circles are great for when they are appropriate, but just because they are popular in England, doesn’t make them the answer to everything. The properly planned and built roundie has a teardrop ‘refuge island’ before each egress/ingress point actually giving a pedestrian a safer, albeit, less direct path to walk. Bicycle facilities are built into the system the same way. Roundies are not typically used in 55MPH roadways, rather 35MPH interchanges. Your point is correct, traffic engineering needs to vet appropriateness, but they do work. I’m a big fan of the roundabouts. As Joshua noted below, Europeans have been using them effectively for years. Hell, in England they drive around them Backwards with no apparent problems. A few years ago I drove about 200 miles across Southern England and never had to come to stop at a red light even once. They do work well and, though folks consistently fear them in theory, once installed people warm to them quickly. I can only imagine the outcry if you ever tried to remove one and replace it with a standard turn lane/light. Another positive is that what wrecks there are are low speed as opposed to the high-speed T bones common when some fool runs a red light. I saw a Federal DOT stat that no one has died in a round-a-bout in the US since they started coming back into vouge in the early 2000s. There is actually a roundabout being proposed by the DoT for an awkward intersection in Albany near the Lee/Dougherty line. The locals I heard from, regarding the plan, were not too enthused. This looks great, except it has permanently crossed my eyes. Can we call this “slipknot junction”? Just imagine how many people will freak out when they see this. Especially when they are driving on the “wrong side” of the road when crossing a bridge. it’s ok dr. jay, they work better at night. As long as I don’t have to listen to that theme music while I’m driving through one . . .
looks interesting. the example does not account for those ramp lights we wasted so much money to buy, install and maintain. if they take those things out maybe this would work. Well, this post is the first I’ve heard about these DDIs, but I think the purpose is to relieve congestion crossing over the interstate, not to relieve interstate congestion itself. It might help a bit, but you still are probably going to have issues with too many people trying to merge onto the interstate at the same time. my worry would be that flow increases to the ramps, then bogs down at those lights thus killing any benefits gained by the ddi. either way, we should find a sucker to buy all the useless ramp light systems that do nothing to reduce congestion. And I love the ramp lights. Sorry they don’t suit your fancy Three Jack, but I know finding myself cursing if I see they aren’t on. Anyone who travels the northern perimeter and thinks they haven’t made a difference in the merging madness is not dealing in reality. My problem with them is that they put them too close to the full speed traffic of the interstate in a number of places. More running room is needed. Although I punch it to merge, too many think 35 is an ok speed to merge with 80. I think they put them up thinking that people would only be driving 55. Which was probably naive on their part. No ones driving 80 near the Dunwoody family at 8:30 in the morning. The rest of the time they aren’t on. I think they’re very successful on the Connector as well as the upper perimeter. But they cause backup onto surface roads in other areas, like leaving the Capitol area and trying to get on I-20 west, which is an area that never really had a history of backing up. The meter stays on even when traffic is backed up onto the surface road. Adding insult to injury, I constantly find myself trying to gun it to highway speed with only 100 feet to spare, but the driver in front of me is on the phone, and going about 35 mph, while highway traffic is nearing 75..ugh. Relax Francis, it’s called hyperbole. For someone with a beer perpetually in a death grip, you certainly take everything extremely seriously and literally. In any event, they are sometime on when traffic is not as bad to prevent traffic from becoming worse and not every place they are found involves your particular route. When they are on, traffic generally would not be going 80, but merging should be done so that your car is travelling at the rate of the cars in the far right lane, you should not expect them to move over for you so you can poke along 10 miles an hour slower, even if that is only 50-40. Unfortunately, the concept of merging is lost on over half the Ga drivers, and they need a considerable amount of runup to reach highway speeds. Time to sell the Pinto Doug (;>). I only drive emerald green Gremlins. Damn right on the ramp lights! Which corrupt DOT person or politician is getting kickbacks over those idiotic things?! Same with pedestrian lights. We never needed to have the seconds counted down to us when we were kids. No telling how much wasted money has been spent on those! Oh, and if you don’t know if it’s safe to cross, wait for another cycle then start from the beginning!! I would like to see how these do in practice. It looks like they are a way of eliminating the foolish left hand on-ramps, which are the source of most of the congestion, without expensive extra infrastructure. If you already had right side only on-ramps, these wouldn’t be neccessary. It defies one principle of roudabouts mention above though, in that traffic conflicts are greatly increased and also imagine merging two or more “stright lanes” with 2 or more right hand turn lanes with the added complexity of coming at an odd angle for people trained in normal intersection design. And by eliminate left hand on-ramps, I mean virtually eliminate. I.e. the left hand turn is really like a right hand turn since it no longer impedes oncoming traffic. Roundabouts are neat but take some getting used to, which a few here & a few there will not accomplish. They get really exciting in heavy traffic or four plus lanes. Recently drove all over New Zealand (on the left side) for a month where everyone zipped right thru them with no problem until the insecure/untrusting American got in there ! In the small towns, no problem…..light traffic..time to think. In busier Europe especially in the massive multi-lane ones it is gut check time, you blink or make eye contact, you loose….2″ clearance is the norm. Would be a long learning process in heavy traffic. But this DD idea uses lights which we understand. I was thinking about this on the way to work this morning and had a better chance to examine it at home. A potential problem I could see in this is if the traffic crossing the I-75 bridge on Pleasant Hill (I used to live off of this exit and know how horrible it can be) stops at the light on the far side of the bridge and people on the near side enter the intersection but are unable to clear it before the light changes, they would effectively block the opposing traffic. This would mean the opposing traffic would be blocked on their far side of the bridge and if people on their near side enter their intersection and cannot clear because of the blockage, there would be a deadlock with no easy way for the traffic to clear itself. There may be a way to work the timing of the lights (it is not obvious if there is one), but that is no guarentee since a plice car, fire truck or a minor accident might disrupt the flow at the wrong time and make it happen anyway. In larger cities, there is a rid painted on the intersection creating a visual ‘box’. In these intersections sign warn drivers not to ‘block the box” or face a stiff fine. I don’t know how well DDI’s work, but in Jersey the jughandles are great. The last time I went to California, which was a long time ago (gasoline was 0.79 a gallon in Gwinnett county and Californian’s were complaining about sky high 1.49 gasoline), they had “do not block intersection” signs with huge fines on them. They did seem to work, but one failure could be a nightmare. Smart drivers would just vere onto the interstate on-ramp after the first hour or so, I would suspect. Could you imagine sweet Aunt Lucy, up from Morven, GA sitting in the middle of a DDI simply petrified? Poor little thing. We’ll soon see how they work. 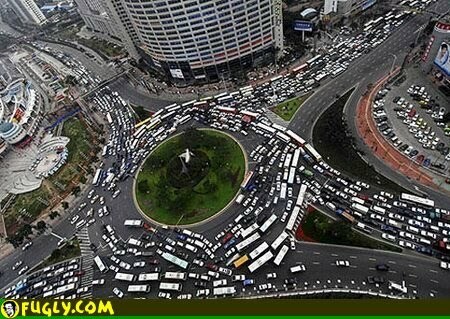 I suspect that the science of traffic engineering will surprise most of us. Thanks for the tip, I am heading that way soon!